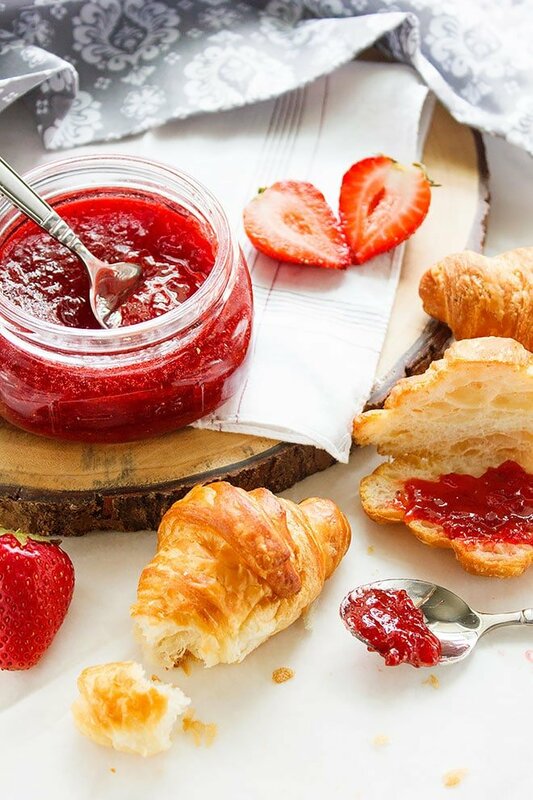 Strawberry Fridge Jam – This jam recipe is the same one you’d use to make a long shelf life jam, where you sterilize the jars and the seals, later submerge the jars in boiling water to help in sealing it, and finally store the jam for a year or so. However, in this version you get to eat the jam almost right away and there is no need to go through all these steps. This method is also known as refrigerator jam and/or a quick jam recipe. This strawberry fridge jam recipe produces a delicious and flavorful jam that will taste far much better than store bought mainly because you made it from scratch and there are no preservatives. 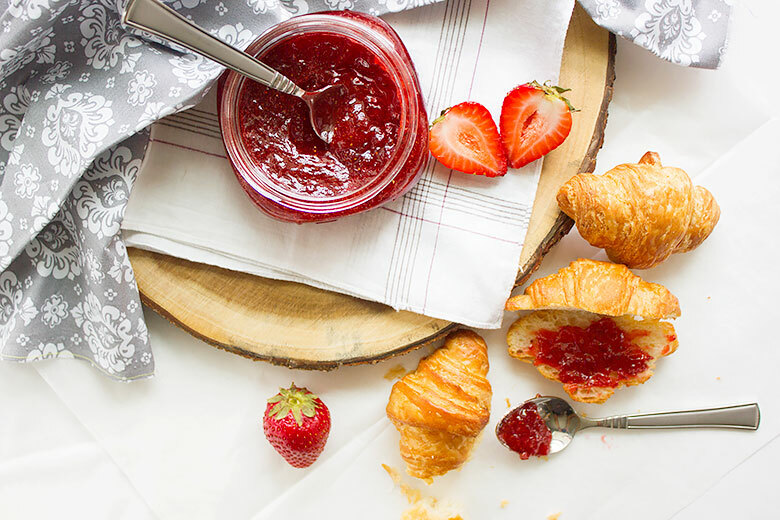 This strawberry jam recipe is without pectin! Have a quick look at the ingredients, yes, please go ahead and skim through the ingredients and the recipe method below. 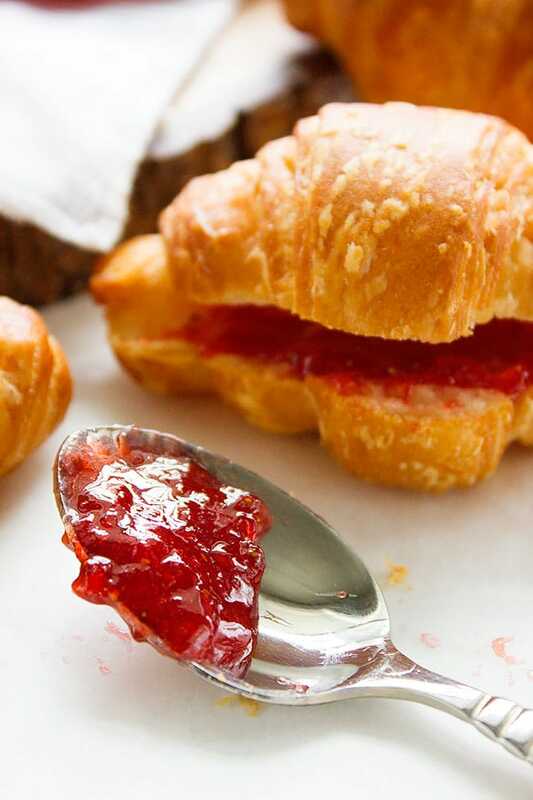 You won’t believe that to make an amazing strawberry jam all you need is three ingredients. You can use frozen strawberries but fresh strawberries are always better to use. I know that some might feel hesitant to try making their own homemade strawberry jam but the process is simple. You can either over cook the jam or under-cook it, in both cases you can still consume it. Don’t feel bad if that happened, we don’t have to experience success in the first attempt. If you over cook the jam it won’t spread easy, in this case all you have to do is to heat the jam in the microwave (just for few seconds) and it will be spreadable. You can use the overcooked strawberry jam in making muffins and fruit bars. 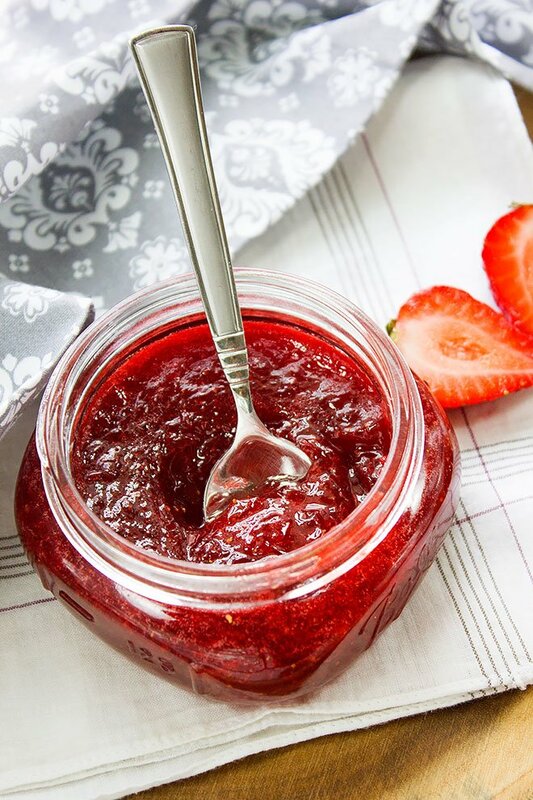 When making jam, under-cooking is not as common as overcooking, but just to be on the safe side and to encourage you to make strawberry jam from scratch, I am sharing a recipe that will make only one cup of strawberry jam. It is a good way for you to practice and I’m sure you’ll have fun making it. I do not enjoy store bought strawberry jam as much as I enjoy the homemade version. I hope that you give this recipe a try and let me know what you think. 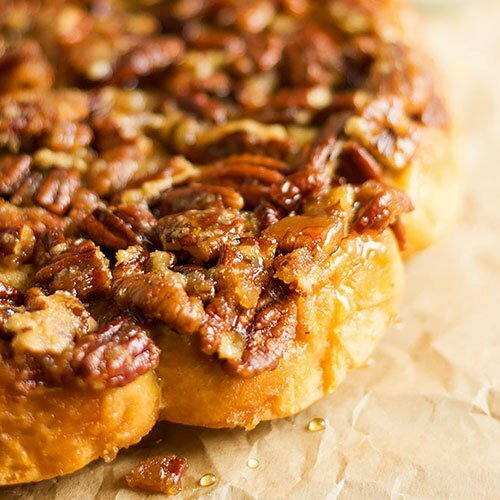 This recipe will make one cup jam. Enjoy! 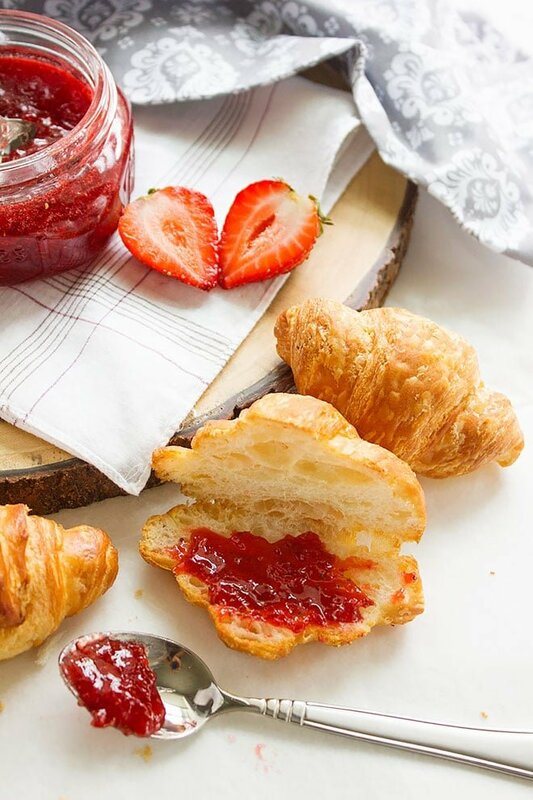 Strawberry Fridge Jam – This jam recipe is the same one you’d use to make a long shelf life jam, where you sterilize the jars and the seals, later submerge the jars in boiling water to help in sealing it, and finally store the jam for a year or so. However, in this version you get to eat the jam almost right away and there is no need to go through all these steps. Boil water in a large pan. Place the glass jar in the boiling water for 10 minutes. Remove the jar using clean tongues. Now, turn of the heat and place the lids in the hot water (not boiling water) for 4 to 5 minutes. Place a plate in the freezer for few minutes. Make sure that you are using a plate that can stand the low temp and won’t break. You will use this plate to check if the jam is cooked and ready. In a saucepan, add all the ingredients and stir on medium high heat. The mixture will bubble and foam but you have to keep on stirring to prevent the juices and sugar from burning. The mixture will start to get darker in color and this is the time to check if your jam is ready. Take around a tablespoon from the hot jam and pour on the chilled plate. 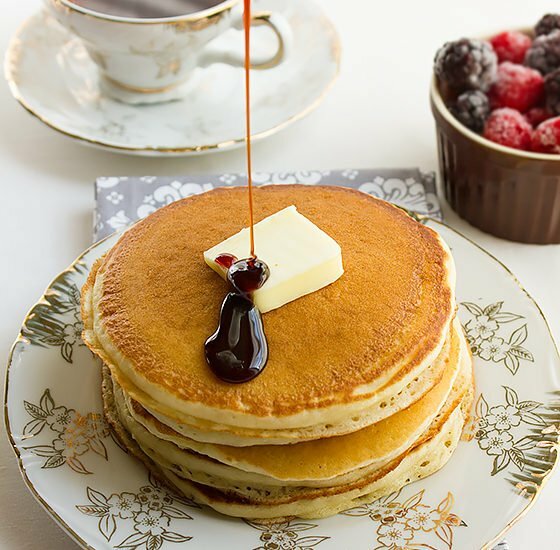 Run your finger through the middle of the jam which you just poured in the plate. 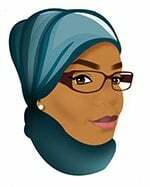 You should have a clear line and both side of the jam shouldn’t be running or meeting in the center. Turn of the heat and place the hot jam in a hot jar. Do not cover the jar. Let the jam comes to room temperature. Close the jar with the lid and store in the fridge for up to 3 weeks. What an excellent recipe. Your recipes are always so good to follow and I love it..